This circular route takes you out of Redruth towards the mining village of St Day. This area was heavily mined for copper, tin, lead, silver and many other minerals and although many of the mines are not apparent today, there are still a few engines houses to be seen. 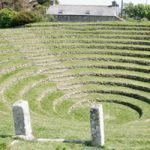 When you reach Menheer Farm turn right and continue up to the next junction, then turn left to Gwennap pit where you can stop at the visitor centre, before continuing your way down Cal Hill and across Sandy Lane. Head back to town via Victoria Park, a beautiful space to explore before heading back to town. Parking – parking at Station Hill car park. Eating and shopping – no stores along the route. 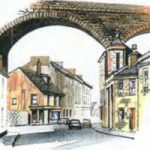 Public houses – There are no pubs on the route. Family and children friendly – the route is family friendly. Cycle Trail – good trail but some rough sections. Horse Riding Trail – some parts are suitable. Walking Trail – a moderate trail. Disability access – not suitable. Built from Carn Marth, Carn Brea and Devon granite, its massive arches are 70 feet high. It replaced Brunel’s wooden viaduct of 1852. The Brick arches in the stone wall are all that remains of the Redruth Gasworks. The gasometers were dismantled in 1976. If you walk a few yards up Gas Lane you’ll see a stream which once provided water power for the machinery and was an open sewer in Victorian times. Designed by Hicks and JP Seddon built in the Gothic style from local stone. James Hicks lived in the highly decorated house next door. Where John Wesley preached between 1762 and 1789, although Gwennap Pit is about 1.7 miles (2.7 km) to the north west of St. Day. The pit was caused by mining subsidence in the mid-18th century. After Wesley’s death the local people turned the pit into a regular circular shape with turf seats.